SANTA CLARA, Calif. (KGO) -- British Prime Minister Theresa May has been critical of tech companies, condemning many for creating a "safe space" on the internet for extremist ideologies. Her comments come in the wake the latest UK terrorist attacks in Manchester and London. In response, Representative Ro Khanna, 17th District of California in Silicon Valley, invited PM May to visit Silicon Valley and meet with tech leaders technology companies like Apple and Google. 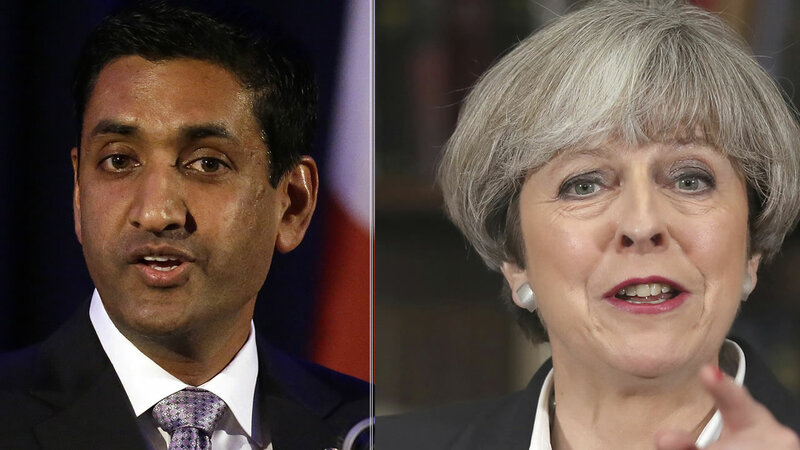 "I hope Prime Minister May will accept my invitation to visit Silicon Valley, at her convenience, to discuss the role technology companies play in helping combat the ideas that threaten international peace and prosperity," said Rep. Khanna. "A dialog between global leaders and tech leaders is an important step to further how online platforms monitor extremist content and keep our communities and countries safe." In the letter, Rep. Khanna highlights some of the steps taken by leading tech companies to remove terrorist content and reduce the reach of extremist groups online. The letter covers how Facebook plans to hire 3,000 new employees to review millions of reports of inappropriate and violent content and how Twitter has suspended more than 636,000 accounts related to terrorism to date. Read Rep. Khanna's letter below.